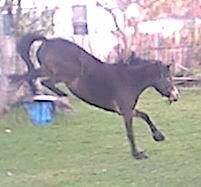 In December, 2003, a little Riding pony mare had something internal go wrong. After vets poking and prodding, giving her needles and such...its thought a cyst on her overies burst. Leaving us with a massive case of founder. 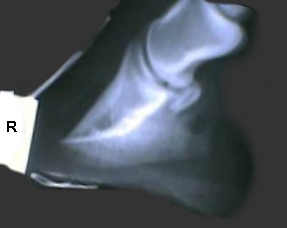 Xrays showed 22% (right) and 25% (left hoof) in both fronts. The verdict was to put her down. There was no hope of saving her, as the pedal bone was about to come out her sole. Now, the pony herself was still a cheeky little girl, she said she just had sore feet, and if l could fix it - she would be mightly pleased as she had things to do in life. A plea was sent out, and instantly on my door step, appeared Yarraman (Carola Adolf). She knew things about founder, and barefoot trimming. She told it to me straight. Said there was a way to save the pony BUT it was not an over night cure. Nor an easy path. There would be set backs and tears, lots of them, and my life would be put on hold while the pony needed me. Once started, l would have to continue the treatment, and she - Carola - would be there every step of the way to help, advise, trim and hand out the tissues. Xrays to show Carola where the coffin bone (pedal bone) was at. The first xray is of the most scarey sight you will ever see. 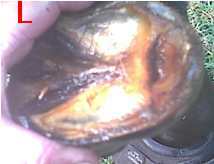 That the pedal bone - sitting on the thin sole. Ready to come out to places where it shouldnt be. Carola trimmed, Mac Boots booted, carpet was layed in the paddock, herbs were used as pain management, and the long long road was started. 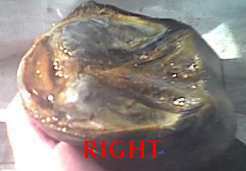 A hoof capsule is all living tissue. Living tissue replaces itself. 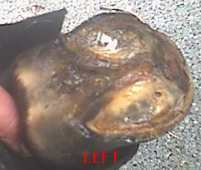 The dead/old tissue is either absorbed back into the horse's system to be sent out via natural methods. Or you get an abcess and dead tissue comes out that way. The whole sole 'died' , shown here on its way out. Underneath that is new soft growth starting to come out. No longer were the hooves concave, the pedal bone had pushed all that down. Thus the need for boots with special inserts (10000 mouse pads died for that!) to hold her sore bits off the ground, to give the hoof a chance to heal/repair. 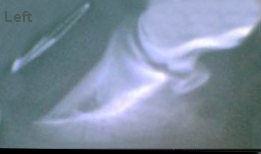 If you look close towards the toe, that hole is where the coffin bone tip had a rest. Three months down the track, further xrays were taken. We have progress. Look for the base of the hoof (line drawn for you). Check the upward journey of the coffin bone. It no longer sits on the sensative sole. She may of mis-understood the 'lightly' bit? Without fail, Carola came , at first, once a week, then once a fortnight, then once a month and still does to this day. There is no doubting her love, care and dedication to horses and ponys. The special boots and carpet paddock where in use until around the 6 month mark. Pony decided she wanted to live with horses and not people, and she didnt use her boots anymore. She was let loose with the others, and pretended she'd never had a brush with death. Now we are a year down the track. Pony is ridden, sound as a bell, and a fair little devil at times. Her last and final xrays were done last week. My vet is very impressed. The angles are good. Time, the founder pony, is now just a common every day pony. Not one with sore feet, not one that needs special care, and not one that had to die. 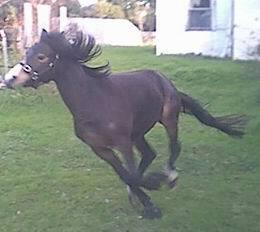 Carola - l can never ever repay you for what you did to save my pony. No amount of money (not that l ever have any) could pay you back for the sparkle that little pony has in her step and her eye. She didnt give up, and neither did you. Nor did David - my vet, who l will love forever for his willingness to step outside the square. He play 'welfare officer' also, and promised to tell me if he noted the pony was in distress and not coping. 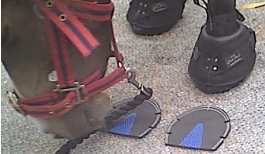 To Mac Boots - the most marvlous product ever invented to help rehabilitate a founder pony. Your gift of free boots, the inserts, the straps - meeting the maker Dave himself, to hear his words of encouragement. To Catherine Bird - who worked out herbs to the very end. Her words of enocuragement also. To all my internet friends and real life friends, who have heard me in tears, hysterical sobbing - you all picked me up and told me to go on. To everyone who has ever had a founder pony - for this is how people learn and teach. Thats it, l've gone all soppy. That is the story of a little Riding pony mare, called Time, who now runs, bucks and bolts around a paddock with her almost blind buddy, Ladybird. Thank you Jeanie for your story and to the many websites that have re - published Time's story while it was happening and years after. Many other horses and ponies have followed in Time's hoof-print's since then.